Felix Baumgartner - Crazy Risk Taker or Calculated Genius? For those of you who have been following this blog for a while, you will know that I like to think of myself as a little bit of an adrenaline junkie. From fast motorbikes to free climbing and diving with sharks to diving out of planes – I love it all. When I told my mum recently that I would love to take up Base jumping (or at least give it a go) she was absolutely shell shocked. She couldn’t understand why I would want to ‘risk killing myself’ like that. My mum’s opinions are probably no different to a lot of others. Risk however, is a very subjective assessment of a situation. We can see this in countless examples in life around us. Money, driving, drug-taking, drinking, smoking, extreme sports, decisions – everything has associated risk, or at least a perceived risk. For example, personally I think taking drugs is an extremely risky idea. For one, I have no idea what I am actually taking given that it has undoubtedly been mixed with a concoction of other things. And for two I have no idea how my body will react and if I could get caught by the police. Other people have different attitudes. Millions of people experiment with and regularly take drugs. They probably still perceive the risk, but mitigate it by buying drugs from ‘reputable’ dealers (if such a thing exists) and experimenting in ‘safe’ conditions – i.e. with others around them, plenty of water and out of sight of law enforcement. Is Taking Drugs a Good Idea? Still definitely not in my opinion! The point I am trying to make is that risk is perceived differently by everyone. One family might think that investing in the stock market is far too risky and keep all their money in a bank; where another family will do some research and understand the risk, try to mitigate it (perhaps by diversifying their portfolio) and be quite comfortable with their choices. Other families might invest but won’t bother doing any sort of research / mitigation and might not care… then things come down to fate. They either get lucky because they picked the right stock or they lose a lot. The same analogy can be applied to personal finance. Some people see finances and saving as something that doesn’t really matter too much. You only live once. Take out a credit card and go on holiday. Deal with the consequences later. We all know someone with this kind of attitude. Unfortunately as responsible PF readers we all know that this attitude soon fades when the debt collectors come round or things get really bad. Others will plan for the unknown and live a life of extreme frugality. The Outcome: Entirely Variable. This is where things change; some people are prepared and have put measures in place to safeguard themselves against unemployment. Savings and other backup plans would tide them through the situation; living paycheck to paycheck would almost certainly bankrupt you. Take a look at your life and consider what risks are present. Do you have a contingency plan? You may have very unique risks as well as generic ones. Self-assess your situation and prioritise what could go wrong. I don’t think so. I watched the Red Bull documentary which covered the whole story of Felix’s journey to the edge of space. A lot of people watching the live show don’t know that Felix actually encountered a problem with the heater on his visor on the way up: his mask was fogging up. I watched as Felix assessed the situation (the live cameras were turned off at the time of broadcast) and looked at the possible actions and the associated outcomes. Pull out the power cord to his suit and go to battery – Perhaps the battery in his suit would kick in and start heating the visor… or maybe he would lose all communications with ground control and nothing would be fixed? Do nothing – Hope that when he jumped that the visor heater would start to work. This would ensure communications were maintained for the time being and give him a shot at the record. This documentary showed a very calculating and risk-adverse side to Felix that was not portrayed through the media. Felix was clearly concerned about living – that was obvious! As most of the world knows, Felix continued the ascent to the edge of space and made the jump. He broke the free-fall speed record and made it back safe. All despite the visor being foggy for most of the way down and almost spiraling out of control. Some might say he was a lucky ‘crazy-man’; I say that he is a role model. If the rest of the world had even a tiny slice of Felix’s attitude towards risk and applied it to personal finance and their lives in general, the economy would be thriving! Risk is not just something that is present in jumping out of planes or driving fast… Risk is everywhere. Stay safe guys! 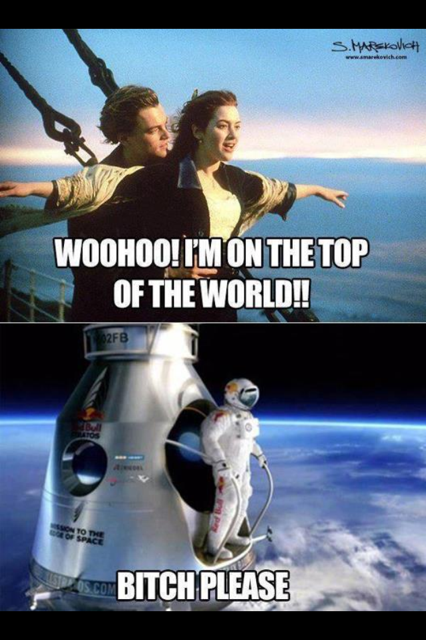 Great analogy…and yes, I think Felix is beyond mental. Of course, that has NOTHING to do with my insane fear of heights at all. 😉 That said, you’re right that risk is everywhere and the smart ones look for ways to use it to their advantage as well as mitigate it. John S @ Frugal Rules recently posted..Is Black Friday All it’s Cracked up to Be? I think you’re absolutely right, and while the world sometimes appears to be crumbling around us, through Felix we have had the privilege the witness the best that mankind has to offer. His courage (and jump) shows there are still some heroes left in the world. Drew @ Objective Wealth recently posted..Ayn Rand Said What About Money & Wealth? I will NEVER jump out of anything in the air, period! He must be a wonderful perfectionist, thing that I am not, and I am not putting my life in someone else’s hands hoping that person is. I take risks with my finances because I measure the risk and it is tangible for me. Plus I am still young so now is the time to try. That’s a nice way to look at it… I like to have at least some control over what I am doing at all times! Like John, I have an insane fear of heights as well. I can’t even ride the projection glider ride, Soarin at Epcot without freaking out. Every time I go on my wife gets embarrassed with me freaking out. But taking risks can have rewards. Investing when everyone is dropping out of the market can seem risky, but the rewards can be well worth it. I haven’t ever done anything too crazy, but I do see where you’re coming from. I asked a friend of mine how his weekend was and he told me pretty good, just wing suited all weekend. Haha by wing suiting he meant jumping out of planes all weekend and wing suiting around and then parachuting down. I like how he just casually dropped it too haha. Felix is an absolute legend. Even though my job is relatively safe, I’m still planning for the worst. I can’t think of anything scarier than maxing out my credit card on stupid stuff I don’t need! James @ Free in Ten Years recently posted..What is lifestyle inflation? James… Very glad you agree my friend! This guy is absolutely crazy and amazing. I can’t believe that he pulled it off. I knew of his name, but had never seen the video before. I don’t know where I have been! So I googled it and watched it. wow! How does someone get to that point in life I have no idea. I have static line jumped, bungee jumped, and have done a few other fun things, but I consider myself to be pretty low on the risk taking spectrum. Actually very low. Is this a good or bad thing? I have no idea. I am trying to get out of my comfort zone a little more. I know NOT taking any risks at all is bad. Just make life boring too. WHAAAT!?! You have been living on a different planet!! Glad you witnessed it though 🙂 That’s wicked that you have done a static line jump… skydive next? There is definitely a ton of risk in our everyday lives that we don’t think about much. I think people are more tuned in to voluntary risk – like jumping out of an airplane – for obvious reasons. You could easily avoid this risk by never jumping out of a plane unless you had to to save your life! We all risk job loss, loss of wealth, loss of our standard of living, etc. It’s important to think about but not to dwell on. I’m fine with certain types risk, but I certainly only do something when I’ve calculated the risk that might be involved. 🙂 I don’t know if I’d be crazy enough to do what Felix did, but I will be going sky diving next year!